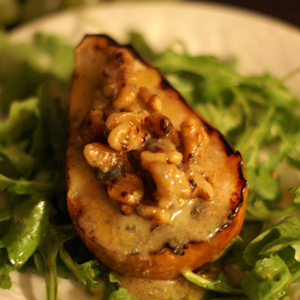 A new favorite recipe for pear lovers, this appetizer is incredibly delicious...and can be prepared in a snap! 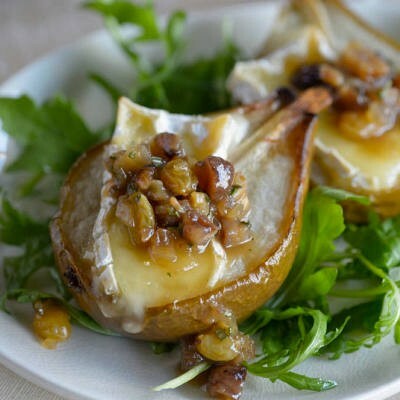 The balsamic glaze is the perfect complement to the sweet pear and salty goat cheese. Slice pears stem-side-up into 12 quarter-inch width vertical planks. Cut large slices in half lengthwise for a total of 48 slices. Heat vinegar, butter, and honey in large frying pan over medium heat for 2 to 3 minutes, stirring constantly, until reduced by half, about 2 tablespoons. Add pear slices and continue cooking for 1 minute, turning once. Place 2 pear slices on each baguette round and top with 1 teaspoon goat cheese. Sprinkle almonds over cheese and garnish with fresh pepper, if desired. *To toast almonds, place in heavy frying pan and toast over medium heat, stirring constantly, for 1 to 2 minutes or until tan with toasted aroma.